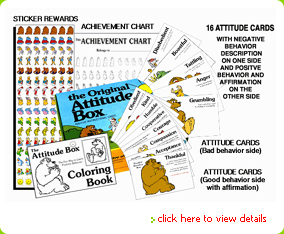 Attitude Box Helps You To Improve The Behavior Of Your Children. The Attitude Box is a resource that allows a parent to direct a child towards good behavior without having to always rely on a parent’s ability to have a positive mindset every time. The Attitude Box is a consistent tool when a parent is tired, stressed or just in need of a helper. Direct the child to go to the friendly Attitude Box and there the child is able to confront his own actions. He brings the correct card to the parent who agrees with the child that it was the right card. Now turn the card over, have the child recite the self-esteem statement (I am ... statement) and reward the child for correct thinking with a sticker. The sticker goes on the achievement chart. It’s that easy. Behavior is a reflection of what a person thinks. Good thinking - good behavior. A parent is able to interact in a positive way with the child and the child walks away with a healthy self-esteem that is reflected in his future behavior. .